TGF Wedding: What is a Carat? Before we get started, don’t confuse carat with the term karat, as karat is a measuring unit used to describe how much pure gold there is in an alloy. Many goods are sold by weight such as kilogram, ounce, pound, or ton, and people who have never bought a diamond will be used to the idea that weight and price are related. They understand that a larger diamond is probably more valuable than a smaller one, but there are two things that often surprise people when they start learning about diamonds and carat weight. The first is the precision with which diamonds are weighed. Diamond weights are stated in metric carats (ct). One metric carat is two-tenths (0.2) of a gram, which means a small paper clip weighs about a carat. The metric carat is divided into 100 points. A point is one hundredth of a carat. Diamonds are weighed to a thousandth (0.001) of a carat and then rounded to the nearest hundredth, or point. Fractions of a carat can mean price differences of hundreds, even thousands of pounds depending on diamond quality. Large high quality diamonds are rare and valuable gems. The relationship between rarity, weight, and value can be surprising – people know that a pound of sugar costs twice as much as half a pound of sugar, but diamonds aren’t a commodity like sugar, which means their price depends on a number of variables with weight just being one of them. This can mean that a 1-carat diamond is worth, say, £5000, while a 2-carat diamond of similar quality might be worth £12000. It’s a simple concept: Large diamonds are more rare than small diamonds, and the more rare something is, the more it is worth. 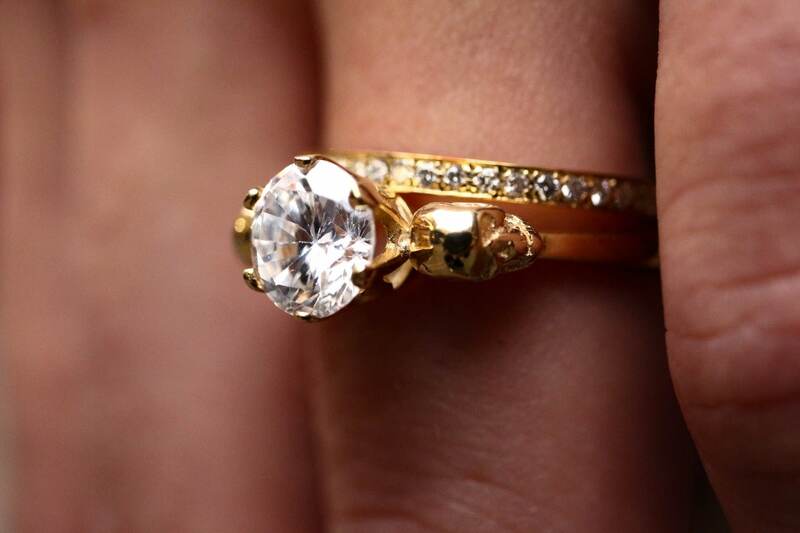 A larger stone doesn’t just cost more; it also costs more per carat. A 1-carat diamond weighs the same as four 0.25-carat diamonds. But even if all the other quality factors are equal, the larger diamond is worth much more than the sum of the four smaller diamonds. Carat weight can also be symbolic. While the visual difference between a 0.98-carat diamond and a 1.01-carat diamond is negligible, many people will opt for the larger stone—even at a much higher price. Some weights are considered “magic sizes”: half carat, three-quarter carat, one carat, etc. There’s not much difference in their weights, but if both are D-color round brilliants with identical clarity and cut, the size makes all the difference. They really don’t look much different, but if a consumer’s heart is set on the one-carat size, the difference is enormous. The fact that the second stone is slightly over the “magic” one-carat size can give it as much as a 20 percent difference in price with only a 6-point difference in weight. GQ Portugal: Are Cowboys Real?